1765 Gentlemans Magazine Road Map: London to Aberystwyth, Briston to Exeter. 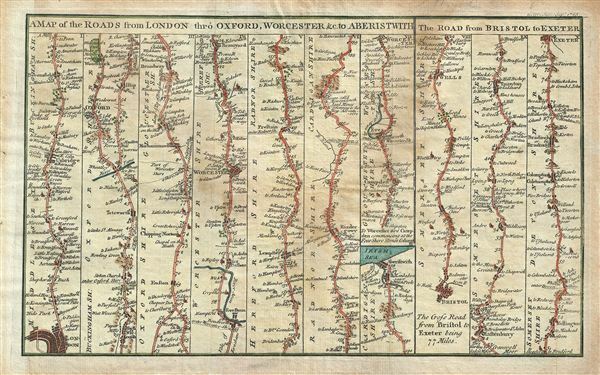 A Map of the Roads from London thro Oxford, Worchester &c. to Aberistwith. The Road from Bristol to Exeter. This is a scarce 1765 example of the map of the roads from London to Aberystwyth and from Bristol to Exeter published in the Gentleman's Magazine. Essentially two maps on one sheet, features ten road strip maps through Middlesex, Oxfordshire, Gloucestershire, Worchestershire, Herefordshire, Radnorshire, Cardiganshire, Somersetshire and Devonshire. Several towns with distances are noted, including London, Oxford, Worcester, Evesham, Aberystwyth, Bristol and Glastenbury. This map was issued in 1765 as part of the Gentleman's Magazine. A Gentlemans Magazine, Sep. 1765. Good. Mild acid burn at center of map - more apparent from verso. Blank on verso. Original platemark visible.